Through the often depressing smog of negativity that has been thrown over Scottish Football from some quarters this season came a shining light at the national stadium. A superb league and cup double was completed by Alastair Stevenson's Hibernian Under-19 side with a 2-1 victory over their Rangers counterparts at Hampden Park on Wednesday. But this match represented more than just an entertaining final that was won in the dying embers of extra-time. It was a vision into the future of both clubs, a nudge to the fearing doubters that the talent has not dried up and, perhaps, something for Scottish sport in general to build on. The Easter Road youngsters strode on to the pitch pre-match as champions and with their mobile phone cameras clicking at a stadium they had only seen from the stands - many being supporters of the club and having watched the League Cup triumph in 2007. Everyone knows the gravy train that circles Leith; in recent years, Hibs have been churning out talented youngsters at a rate with which other clubs in Scotland simply cannot compete. In January 2007, their youth supremo John Park - like many of his students - went west along the M8 and is now the football development manager at Celtic. The likes of Kevin Thomson, Scott Brown, Steven Whittaker, Garry O'Connor and current striker Steven Fletcher all graduated under Park, with this latest batch the final fragments of his gold-laden era. How healthy is the future of Scottish sport? From clean-sheet king Thomas Flynn in goal, to livewire Calum Booth at left-back and Republic of Ireland Under-19 international and double goal hero Kurtis Byrne up front, there is much for everyone at the Edinburgh club to look forward to. Byrne in particular has written the headlines recently. His very late winner in the cup final is married to the very late winner he scored in the game that sealed the league title at Fir Park last week. The Rangers team are younger than that of their opponents, but there was enough evidence to suggest those cynical of what the Murray Park training facility has produced could soon be eating their words. In goalkeeper Grant Adam - who was involved in an unfortunate collision with Hibs' midfielder Fergus Bell and subsequently stretchered off - they have an assured young man who claimed everything that came his way. Seventeen-year-old centre-half Danny Wilson has already attracted the attention of Premier League side Tottenham Hotspur and the youth league's top scorer, Archie Campbell - who notched the equaliser on the night - was a buzzbomb up front. 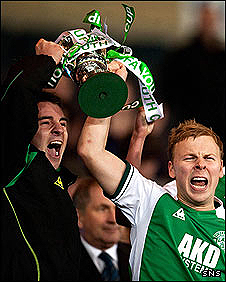 They had pushed a Hibs side - many of whom will be available to club manager Mixu Paatelainen from next season - all the way in the league and in the cup final. Paul Hanlon at Easter Road and John Fleck at Ibrox have made that transition in recent months with ease. However, there remain question marks in Scotland generally about facilities and grass-roots physical education. 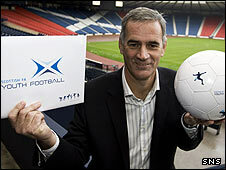 The director of football at the Scottish Football Association, Jim Fleeting, is passionate about rearing sporting talent from primary school age in Scotland. He wants to see many more get the same opportunity as those who graced the Hampden pitch in this year's Youth Cup final. "Just imagine if we get the kids from eight years of age and we gave them the support needed in physical literacy," he told BBC Scotland. "That is the age these kids need the support, otherwise they're disadvantaged compared to what happens in later years. "In Germany, for example, they go to primary school at eight o'clock in the morning and finish at one o'clock in the afternoon - and stay at school after that 'til four o'clock, when they can do sport, drama or music. "In Scotland, however, we go from nine o'clock 'til half past three and there's only an hour and a half of activity a week. "I'm desperate for a 'champion' to take this on and get some heads together to sort this out." There is clearly work to do and this year's thrilling Youth Cup final was reason enough to encourage the relevant changes to be made and, with the Commonwealth Games due in 2014, there cannot be a better time. Meantime, Hibernian Football Club can now look forward to a new brood of players who have the potential to be even more Hollywood than those who came and went before them.